Mizpah Methodist Church in present-day Olar was built in 1856 as an original part of the Bamberg County settlement of Buford’s Bridge. Records indicate that a log cabin was used for Methodist worship services in this area as early as 1819 before the congregation combined with a Baptist group. The two denominations then alternated worship services in a local school building. The two groups later built a joint meeting house in 1826 called the Philadelphia Meeting House, but the churches divided over theological disputes. The Methodists built a separate meeting house in 1832, while the Baptists kept the Phildalepih Meeting House, changing its name to Philadelphia Baptist Church. The former Buford’s Bridge community was named for Major William Buford for the bridge he helped build over the Great Salkehatchie River as early as 1792. A merchant village developed around this settlement by the 1850s, and the Methodist congregation relocated two miles away to the thriving community and built this church in 1856. In 1865 Federal troops burned and destroyed many properties here on their way from Columbia to Savannah, Georgia, at the end of the Civil War. Mizpah Methodist Church was the only building left intact and unharmed during the raid. Following the war, Buford’s Bridge became sparsely inhabited and eventually became extinct. Today the area is known as Olar, and the church still has an active congregation and holds regular services. 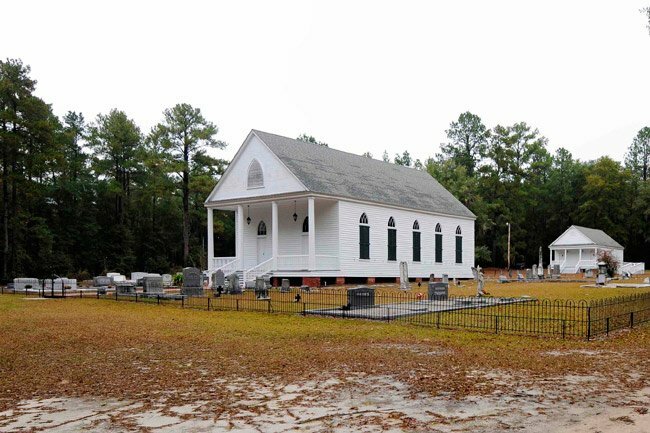 Constructed in 1856 in the village of Buford’s Bridge, Mizpah Methodist Church is the only extant building from the old Barnwell District town that flourished in the nineteenth century but had all but disappeared by the early twentieth century. 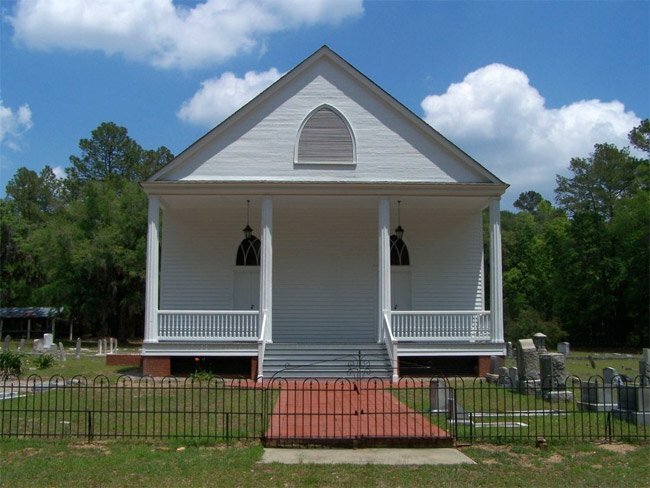 The braced frame, sheathed in weatherboard church is an extraordinary surviving example of the vernacular meeting house form, typical of many rural South Carolina churches, but with the added sophistication of both Greek Revival and Gothic Revival elements. The historic cemetery surrounding the church contains gravestones and iron Maltese cross markers for a number of Confederate veterans, as well as those for many of the church’s early families. In fact, some of the gravestones are signed by their cutters. According to local tradition, Mizpah Methodist Church was the only residence or institution in the Buford’s Bridge community that was not burned or otherwise destroyed by Federal troops during their stay during the closing days of the Civil War. Mizpah Church is significant as a tangible reminder of one of Bamberg County’s earliest and continuously functioning Methodist congregations. While we have not specifically read that anywhere it would not surprise us! Your best bet is to call the church directly. Google has their number listed as (803) 368-8863. Let us know if this is indeed true! What an exciting prospect! Recently spoke with gentleman in Olar. I am writing a book. The man told me that there are still hoof prints of the horses on the floorboards of the Church. (Civil War- Union Army) Is this true?